So they shut down the Federal Government because these congressmen can not behave themselves and spend our money in a conservative and logical manor. I say go ahead and do it. 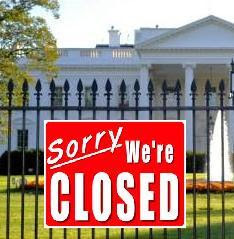 However we all know when they shut it down instead of shutting down all of those programs and agencies that we will not even know are gone which is more than half of the federal government, they will more than likely shut down things that will impact the most. Here are some interesting things provided to me by one of our Mortgage Broker members that they could do to the Mortgage Industry. FHA Case Numbers: For each FHA loan, we are required to order a FHA case number. This number is generated before an appraisal can even be ordered. With a shutdown, we may not be able to order case numbers. Because of this, it is critical to let us know if there is a contract executed on any loan, so that our office can go ahead and order a case number without risking the loan being on hold during a shutdown. Note: with the new FHA guidelines, a contract must be executed before a case number can be ordered. The ability to close FHA loans is questionable, depending if HUD keeps its website running to obtain FHA case numbers and CAIVRS (During the November 1995 shutdown, case numbers could not be obtained, but this was prior to the internet and was a manual process). The shutdown in 1995 mainly caused a delay rather than a drop in FHA loan origination, but if lenders decide to stop accepting FHA applications, it could be a problem. I think we will see delays but not a complete shutdown of the FHA. 4506 IRS Transcripts: Each loan requires the verification of at least one tax return by the IRS to verify the numbers that each customer presents us on their tax returns. During a shutdown, this process would be delayed as the IRS wouldn’t be at work to verify the transcripts. Verifying Employment of a Government Employee: We are required to verify the employment of each customer. If the customer is a federal government employee, we would be unable to verify his or her employment during a shutdown. FEMA: Homes in a Flood Zone: Homes that are determined to be in a flood zone would not be able to close as flood insurance could not be obtained. USDA: During a shutdown, the USDA office would be closed because they have government underwriters that insure behind the lender. With a shutdown, we would see delays with all USDA loans. VA: Like the FHA, the disruption is possible -- but not absolute -- during a shutdown. This would all depend on if they continued to allow their website to function. A disruption would cause delays in VA appraisals and the issuing of certificates of eligibility. If the website was closed during a shutdown, we would see delays in all VA loans.